Learn Archery NOW! - Your Simple Steps To Success! While I strive to provide answers to as many questions as possible regarding archery, the information contained in this website should not be used as a substitute for proper professional training. 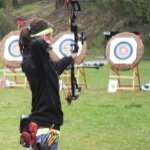 Learn-Archery.com will not be held accountable if you have suffered an injury. If injury occurs you should see your family physician, certified athletic trainer, or other health care professional trained in the treatment of sports related injuries. Most municipalities prohibit or restrict the use of archery equipment within the city limits. Knowledge of the law is your responsibility. Safety is your responsibility. Regardless of where you choose to discharge an arrow from any bow, you are responsible for all injuries and/or property damage and Learn-Archery.com will not be held accountable. All of the information contained within this website is for educational purposes only. 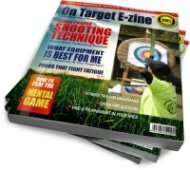 All articles and graphics are copyrighted and may not be reproduced or used without written permission of Will Zeober, Level 3-NTS Coach, owner and creator of Learn-Archery.com. does not influence the information on this site. I always give my honest opinions, findings, beliefs, or experiences.